During summertime, I love eating cold tofu. I grew up eating cubes of cold firm tofu topped with soy sauce, dried katsuo (bonito) fish flakes, and thinly sliced green onions, with a side of hot steaming rice. Soooo good. Of course, the fish flakes became a no no when I became a vegetarian. I tried eating cold tofu with just soy sauce, and it was . . . uneventful. Nowadays, I eat cold tofu drizzled with the same spicy sesame dressing that I use to make spicy soba noodles and topped with a mixture of very thinly sliced scallions and finely diced green and red bell peppers. For a nicer presentation, cut a slit (making sure not to cut too deep or too close to the edges) into a block of tofu sliced on the diagonal and stuff with the vegetable mixture. 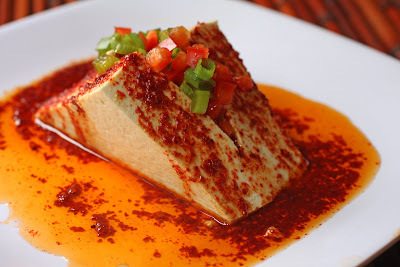 Gonna give this a try - cold tofu just doesn;t do it for me on its own.